Thursday December 20th 1923 We were in Jacksonville when I woke up this AM. I went out to the depot for my breakfast. I left on good train at ten oclock. At DeLand on time. Came over to Hutchinson Hall for dinner. Mrs Falk came later. Her car had been run into yesterday and was not fixed yet. We walked up to The Pickens and he brought us out. Friday December 21st 1923 Worked on Lauras bag in AM. Mr Pickens was out and took us to town at two oclock. Did some errands and came home in Mrs Falks car. It was ready for her. Saturday December 22nd 1923 Busy with my own affairs all AM. We went to town soon after dinner. I sent away some mail. I found my trunk had come and sent it out. I have had quite a few cards and messages. weather like summer time. Sunday December 23rd 1923 I party unpacked my trunk before time to go to church. Went to M.E. S S and to The Falks church. We had dinner in town and came right home. Wrote letters. Monday December 24th 1923 Worked on Lauras bag in AM. Mr and Mrs Falk and I went to town in PM. Did errands and to picture show. Evening at home. 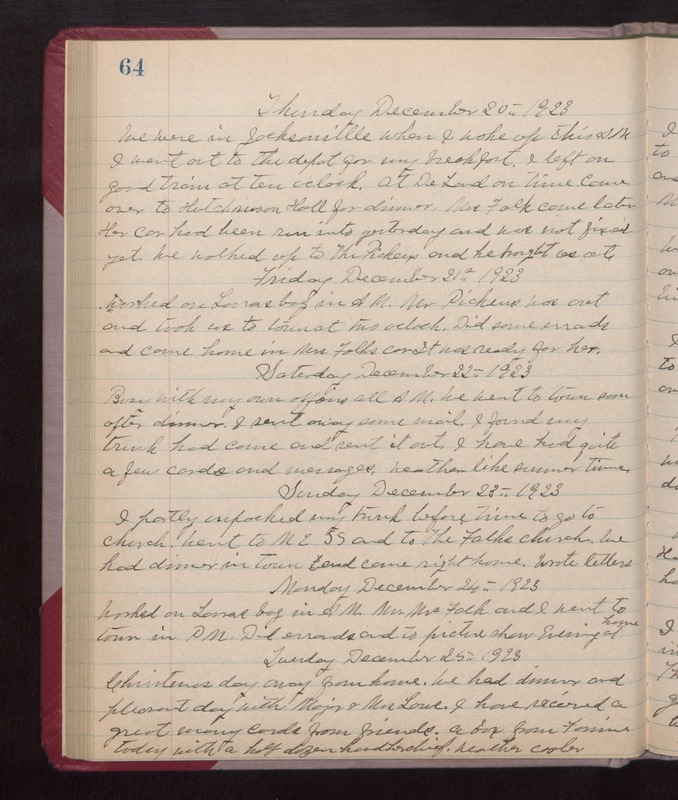 Tuesday December 25th 1923 Christmas day away from home. We had dinner and pleasant day with Major and Mrs Lowe. I have received a great many cards from friends. A box from Fannie today with a half dozen handkerchiefs. weather cooler.